Be sure to look beyond the obvious when traveling in Italy. Enter the city of Verona. Tourists travel here for the obvious Romeo and Juliet experience and to see the famous Roman Arena on Piazza Bra, one of the biggest and best preserved arenas from the Roman Empire. Or to cross the Ponte Scaligero and visit Castelvecchio, a 14th century fortress with M-shaped merlons that run along the walls of the bridge and castle. The Castle and Bridge were my first introduction to the city in 1999, a stop-over on a road trip with my Italian cousins on our way to Venice. On this trip I would be spending more time in Verona and I began with dinner. A walk down from Piazza Bra along Via Mazzini (a pedestrian only street) will lead you to well-curated shops, chic boutiques and restaurants that preserve the gastro-history of the Veneto. One of these restaurants is Ristorante Greppia on Vicolo Samaritana. The street, a small-secluded alley-way (vicolo), takes its name from the Biblical Samaritan woman and the restaurant from the courtyard tavern where horse drawn carriages took travelers to the train station. The tavern was called greppia (manger) because it was the place where the horses ate. A less than obvious place for one of the best meals I have had in Italy. 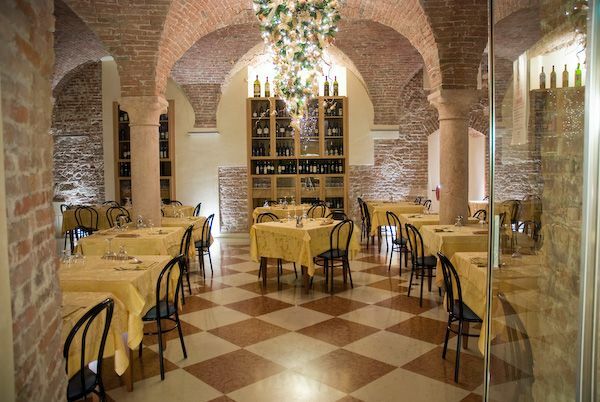 Greppia is described as a restaurant of cucina tipica Veronese and although it serves food and wine typical of the region, there is nothing common about the experience you’ll have dining here. The food, hospitality and atmosphere at Ristorante Greppia were exceptional. We ate in the upstairs dining room but there is a brick vaulted dining area downstairs that looked very nice. There were 6 of us including 2 children and everyone couldn’t be happier. I had the Tortelli di zucca mantovana (pumpkin ravioli) and it was as good as I have had it in Mantova and Ferrara. I definitely plan to return for the fegato di vitello alla veneziana (sauted calf’s liver with onions). After dinner we spent time walking to Piazza delle Erbe, one of the most picturesque squares in Italy sight-seeing the buildings, towers and sculptures in and around the square including Palazzo Mafei, topped with six sculptures of the gods Jupiter, Mercury, Venus, Apollo, Hercules and Minerva. Then there are churches guarded by hunchbacks (Sant’Anastasia), piazze, bridges, gates and gelaterie including Gelateria Savoia (said to serve some of the best gelato in the area) that all bear a second look. The first time I traveled to Verona I saw the obvious and like many of my travels in Italy, Verona deserves a another look to see and savor a city. 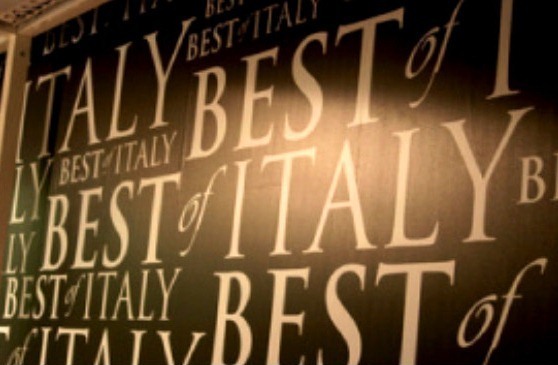 Is the Best of Italy Really the Best of Italy? I did a Bing search the other day on the Best of Lists. The Best of Italy came up with 530,000,000 results. 7,880,000 results for Best of Tuscany. 13,300,000 results for the Top 10 Things to Do in Florence and 193,000,000 results for Best Place to Eat in Italy. Google web pages, images and videos totaled 1,440,000,000. I’ve been traveling to Italy for 15 years and driven over 15,000 miles on road trips with my Italian family and friends and I would be the first to say that Italy is AMAZING. There should be no excuse to come back from a trip to Italy without boasting about the most wonderful food you ate, wine you drank and what you saw but can everything be the best? Travel related websites and guidebooks are not shy about giving their opinions on what they consider to be the best. Frommer’s has multiple Best of Lists including one of my favorites (Italy’s Best-Loved Driving Tours) . Gayot’s recommends the Top 10 Hotels for a buona vacanza. At Fodor’s you can find just about the best of everything including the best cathedrals, ruins, museums, luxury and mid-range hotels. There are ezine articles by “expert” authors and tips from TV personalities and travel gurus. BBC’s Lonely Planet, the largest travel guide book and digital media publisher in the world, is used by over 600,000 travellers for trade tips and travel recommendations. Publications, numbers and experts would lead us to believe that we should take their advice. Like the famous TV commercial of the 70’s when the once powerful Wall Street firm E.F. Hutton advised investors that “When E.F. Hutton talks, people listen”, shouldn’t we be listening when we’re told this is the best of? Yet even the word “best” is relative, defined as “most likely to succeed; most likely to come near to the desired outcome, most intimate; liked, trusted, and confided in more than anybody else”. So what’s a traveler to do. It would be foolish to ignore the advice of travel insiders yet there is a Danish proverb that says “he who builds to every man’s advice will have a crooked house”. Avoid the lemming mentality of travel. Don’t just blindly jump off the travel cliff and hope for the best. Determine what is most likely to come near to the desired outcome of your travel experience. Research your options and look to trusted sources that share the same aesthetic for travel that you do. Not everything is the best for everybody. Discovering the good, better and best of travel is part of your travel experience. Begin to make your list now. Contrary to popular opinion more is not better in Italy. The understated elegance of Milanese fashion, the sleek refined lines of Ferrari and the belief that a few ingredients can transform a dish into a delicious work of art does not equate to the abbastanza “bigger is better” attitude found on many Italian-American restaurant menus . The model that less is more and form follows function translates well with Italian cooks who live and die by their ingredients. They believe that the flavors inborn in the main ingredients themselves are the stars of the dish. So well-curated ingredients like pasta, extra olive oil, fresh garlic and basil, prosciutto and pancetta and balsamic are essential to Italian cooking . Ripening in dark, silent aging rooms, refined for years through a series of barrels of different woods and decreasing size; traditional Aceto Balsamico from Modena is one of the great gastronomic treasures of Italy. In the pantheon of Italian food products it stands above all others. Aceto Balsamico has such an extraordinary depth of flavor and aroma that a few drops of an artisan aged balsamic vinegar is all that is needed to elevate your cooking. Following DOP regulations Trebbiano grapes, grown for centuries in the province of Modena, are crushed, cooked and aged with skillful attention according to ancient traditions. As the vinegar ripens, it takes on the flavors of different woods and condenses into a smooth syrupy texture with a fullness of flavor, both sweet and savory, and a deep rich marrone color. 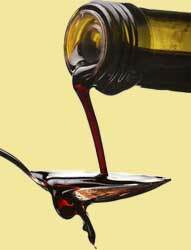 Barely a teaspoon per person is all that is needed to enhance the flavor of meat, fish, salads, fruit, cheese even chocolate and vanilla ice cream; season a sauce or finish a dish. A weary traveler could benefit from knowing about the ancient workshops and antica farmacia (pharmacies) where healing ingredients from nature create an Italian sense of benessere. They can be found all over Italy if you know where to look. Behind an unassuming entrance on Via della Scala 16 down the street from the Santa Maria Novella train station is one of the oldest farmacia in Florence, Santa Maria Novella Farmacia also known as the Officina Profumo Farmaceutica di Santa Maria Novella. A fragrant universe filled with terra-cotta jars and gilded urns that was already well-known in Dante’s time. It was established in the 13th century by the Dominican friars of Florence who began to cultivate and prepare medicinal plants and herbs used in the treatment of the sick. Many of the products available for purchase today are based on the ancient recipes of the friars. SMN products are truly unique. Soaps are made by hand, molded with antique equipment and aged like a fine cheese. Potpourri are made from flowers and herbs grown in the Florentine hills. 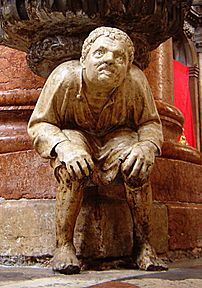 Ancient and evocative preparations like elixir Alkermes (a rare but obtainable exlir said to offset weary and lazy spirits) were formulated by friar-chemists. There are calming waters for tired or puffy eyes, an aromatic vinegar (Aceto dei Sette Ladrei) said to be useful for fainting spells and an antihysteria water which I am pleased to say I haven’t needed yet. One of the first alcohol based perfumes, Aqua della Regina, was created here for Caterina de’Medici, an essence she took with her when she became the Queen of France. Every time I travel to Florence I live the life of a Medici princess and buy soaps, scented wax tablets and carta d’Armenia, little strips of paper that smolder and freshen the air with a breath from the Renaissance. 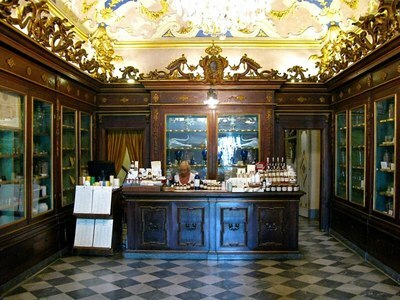 Although the frescoes and imposing salons of SMN Farmacia may seem more like a museum than a working pharmacy, don’t let the ornate interior and gilded furnishings deter you. There is much to see and enjoy and there is an English lista of everything in the shop. The sales staff is open to polite requests for information and help (although I have heard otherwise). Just plan what you would like to buy and ask for it with intention. I’ve traveled to Milan for the last 15 years on both business and pleasure. My Italian cousins live in Milan (Porto Genova) and in Sesto San Giovanni, a suburb of Milan about 6 miles from the city. I usually stay in Sesto and take the tube to Milan Centro but this year I stayed in an apartment in Milan. Down the street from the Duomo, near Zara and Geoxx, around the corner from the Galleria and Pecks I was right in the heart of the city and if the number of people pulsating through Milan’s main arteries was any indication of the health of the city, I would say it was in danger of a cardiac arrest. The frenetic pace was a little overwhelming and decidedly different from my past times in the city. When I first traveled to Milan in the late ‘90’s, the city was vibrant and bustling with an Italian urban vibe that reflected its role as the 5th largest city in the EU, the largest city in Italy and according to my Milanese cousins the most important. Milan is Italy’s center of commerce and industry, fashion and finance and even with a population well over one million, the refined Milanese seemed to be able to balance it all. The trams, traffic and people all moved with the determined synchronicity of a large metropolitan city and although the “juxtaposition of different centuries and styles” (ancient , Gothic Renaissance, Romanesque, neo-classic, art deco, post-modern) can be mezmerizing, Milan seemed to take it all in stride. In Milan you can attend performances at the venerable La Scala or at the modern Teatro degli Arcimboldi. You can shop couture on Via MonteNapoleone or the quaint shops of Leonardo’s boho Navigli canal district. 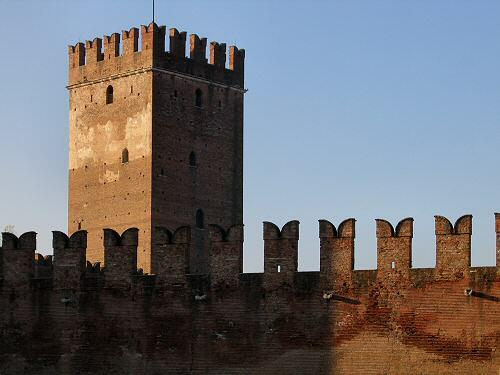 You can visit a Visconti palace (Castello Sforzesco) and then take a stroll through Parco Sempione. In Milan you can eat in some of the most exquisite restaurants in the world or grab a panzerotti , a pocket of soft billowy dough that tastes like a closed pizza, from a street side shop down from the Duomo. I had mine standing in line with my Italian cousins on a rainy October afternoon with about 30 other munching Milanese savoring every bite at Luini’s panificio on Via S.Radegonda 16. City dwellers and in-the-know tourists line-up by the dozens for Luini’s famous doughnut-like pizza. A gastronomic specialty from Puglia, panzerotti were brought to the Milan in 1949 by Giuseppina Luini seeking her fortune in the post-war Lombardian capital of the north. Panzerotti may be a metaphor for my magnified view of Milan 2012. Over-stuffed yet filled with a flavorful mix of people and cultures with dreams of success and the will to make those dreams come true. Sounds to me like another larger-than-life city in the US where our Nonna traveled to in 1920 along with thousands of other immigrants. Except instead of a lady in t he harbor with a torch to light the way, Milan has a great cathedral with Gothic spires that rise out of the concrete earth of the main piazza like it had materialized from thin air. In the fairyland of statues on the rooftops of the Duomo cathedral is another lady of meaninful beauty. 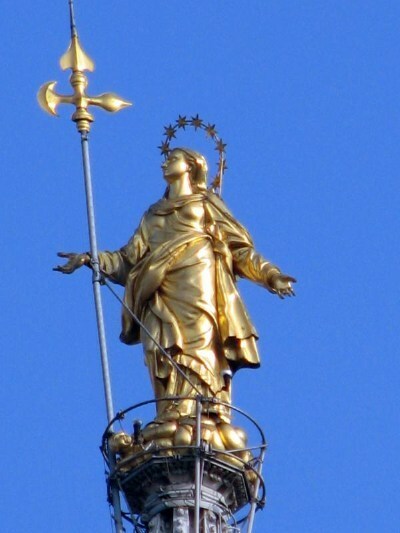 Perched on the top of the highest cathedral spire (the guglia del tiburio “lantern spire”) is a gilded statue of the Virgin Mary or Madonnina, (little Madonna), Milan’s shinning beacon to the rest of the world that leads their way into another city with a big heart. I hope the Milanese can manage to keep it heart healthy.